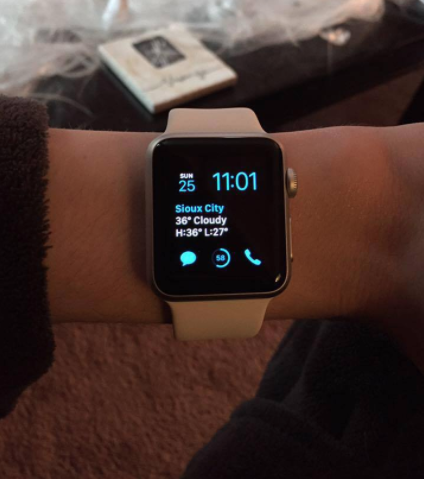 I received an Apple Watch for Christmas this year. It is the 38mm Apple Watch Series 1 in silver with a white wristband. I have been using it over this past week and I think I can fully write this review. Design: The Apple Watch’s design is quite beautiful. The screen is bright and refulgent, which is good because of the fact that the screen is smaller than the 42mm. Apple’s Digital Crown is the most innovative part of the outside design. It controls the navigation of the watch and allows for people to access the use of our good friend, Siri! watchOS: watchOS 3 has been the best way to use the watch. Although I never got to use the previous version of Apple’s watch operating system, from what I have heard, it’s made things a lot easier. The dock has made it really easy to simply close apps, which is great for saving battery life. Internals: One thing that I really love about the watch is its ability to simply vibrate whenever I get a notification, whether that be a text message, Twitter, or when someone is calling me. A lot of smartwatches on the market do not offer that. I also like how easy and fast it connects to my iPhone 6. I love being able to see my notifications come to my wrist for the first time in my life. It really is sometimes easier to just lift up my wrist and answer a text message. Speaking of messaging, there is this awesome thing you can do on the watch, which Apple calls “scribble.” Instead of speaking into the watch, you can write what you’re saying. It works great when you don’t want to take out your smartphone but also want to write a “private” message. Apps load pretty fast and work well given that they are on such a small screen. A lot of apps to choose from and download. Sometimes messages do not send. Needs to be not so reliant on your iPhone. Make it easier to put on. I put this on here because it needs to be something that is so stupidly simple. Right now, it’s more complex and could be done in a more efficient way. watchOS needs to be just a little bit more user-friendly, not everyone understands how to use it. One last thing I will list in this review is how easy it is to use Apple Pay on the Apple Watch. All I had to do at Starbucks is put my watch over the debit/credit card reader and it accepted the payment. It does not get any easier than that. Overall, the Apple Watch Series 1 in 38mm is getting 3/4 stars. There are a lot of things going it, but there is also room for improvement in the future.